Tongan-born wing Lesley Vainikolo crossed codes in 2007 after a successful career in rugby league with Canberra Raiders, Bradford Bulls and New Zealand. He made his union bow for Gloucester in 2007, scoring five tries against Leeds at Kingsholm. Having qualified through residency Vainikolo made his international debut for England as an early replacement against Wales in the 2008 Six Nations, subsequently featuring in all of their tournament matches. With Martin Johnson taking the England reins in June 2008, Vainikolo found himself left out of both the England Elite Player Squad and the Saxons squad ahead of the 2008-09 season. 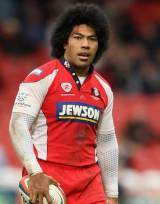 Following Gloucester's derby win over Bath in the Premiership in October 2008, Vainikolo was arrested and charged with GBH after a brawl outside the Second Bridge nightclub in Bath. He was ordered before Bristol Crown Court in January 2009. In January 2012 he announced a shock move to French second division club La Rochelle with immediate effect.